There are two roads from China to Kyrgyzstan, and I took the one via Tash Rabat and the Torugurt Pass. Both roads offer really pretty landscapes, but the Torugart route is somewhat less used because it’s more complicatedly bureaucratically. But it offers the added perks of passing Lake Chatyrl-Kol Lake and the old caravanserai Tash Rabat. Below are a few photos. I begin this post–unashamedly–with a photo taken from the window of a moving van. Why? Because it would be hard to do otherwise. 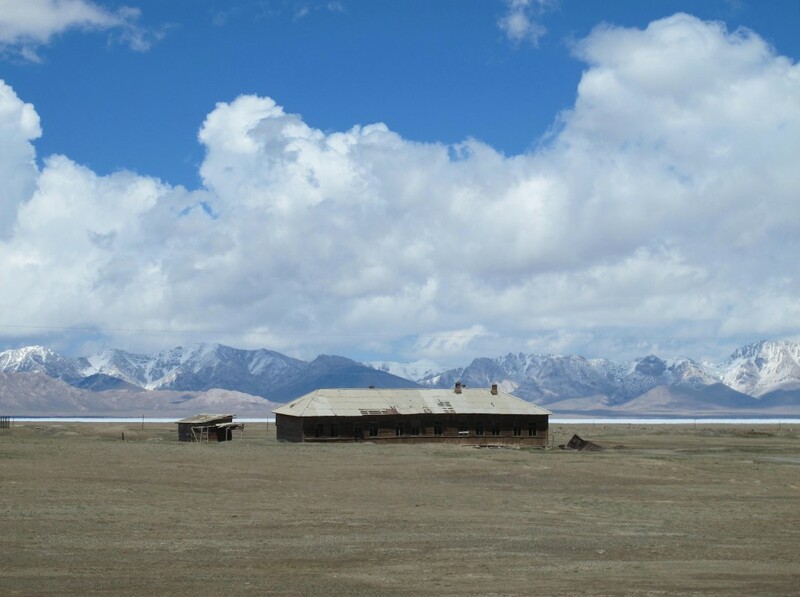 The Chinese border post stands a good 100 kilometers back from the actual China-Kyrgyzstan crossing at Torugart Pass, probably because there are no villages out here. Furthermore, the government seems to require foreigners to arrange guided transport for the two-hour drive from post to pass. I suspect this is because they don’t want us running around snapping photos of this very beautiful, narrow, red rock valley. 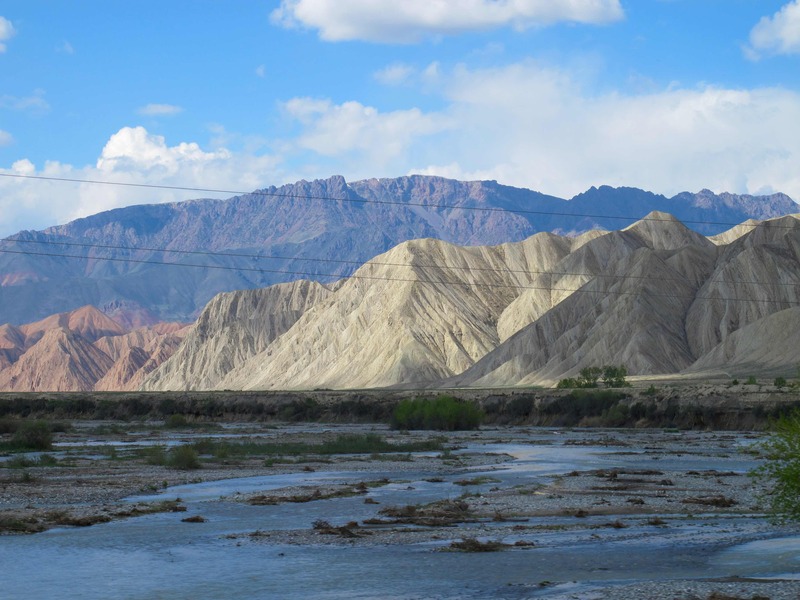 However, the sad result is that travelers are typically hustled quickly through this pretty landscape in SUVs. Once across to the Kyrgyz side of the pass, you immediately encounter the alpine lake Chatyr-Kol (3,530m). Yurts will pop up here in summer, but in late May it was still a frigid mountain-scape of just a few scattered wood buildings. Most of the activity comes from the stir of clouds. This sort of creates the feel of a ghost town (without the town). 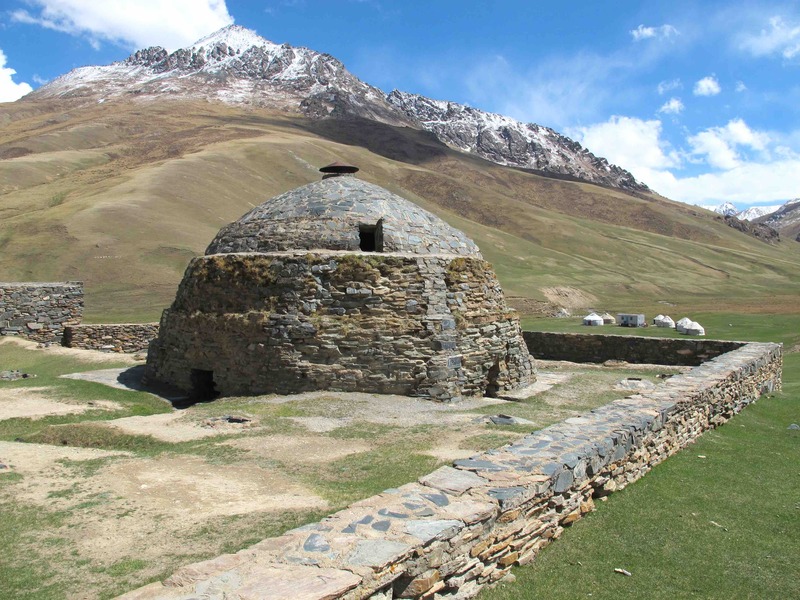 12km north of Chatyr-Kul, the caravansarai Tash Rabat sits nestled in a southern spur of the Tian Shan Mountains. 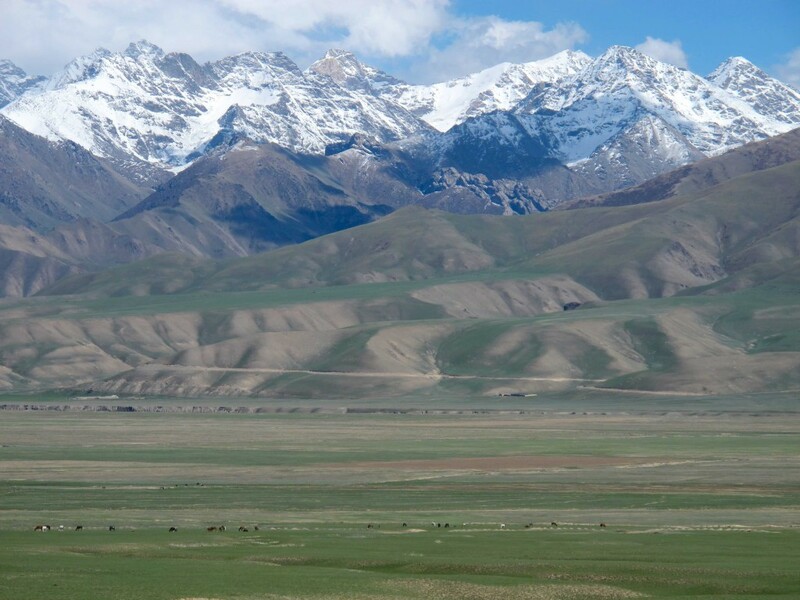 The caravansarais of Central Asia were the few built-structures in this mountainous region of nomadic shepherds, and they facilitated commerce by serving as inns and trading posts along the major trade routes. The full history of Tash Rabat is unknown, but it dates at least from the 15th century. A little reflection helps clarify why Tash Rabat–otherwise a small building made of crushed stone–is so fascinating. Recall that traders would spent days or weeks traveling this region, where everyone and everything is mobile. For a nomad or trader, eventually coming across the only built-structure for hundreds of miles would be a pretty unique experience. But while Tash Rabat is a pretty outstanding topographical feature out here, its architectures seem to have mirrored the landscape by building it into a hillside with the same stones that litter the region. 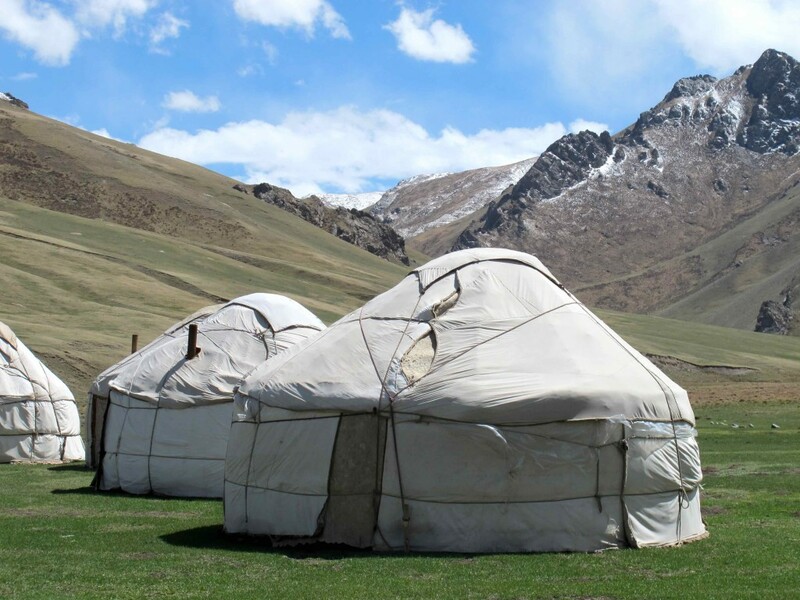 Yurts. 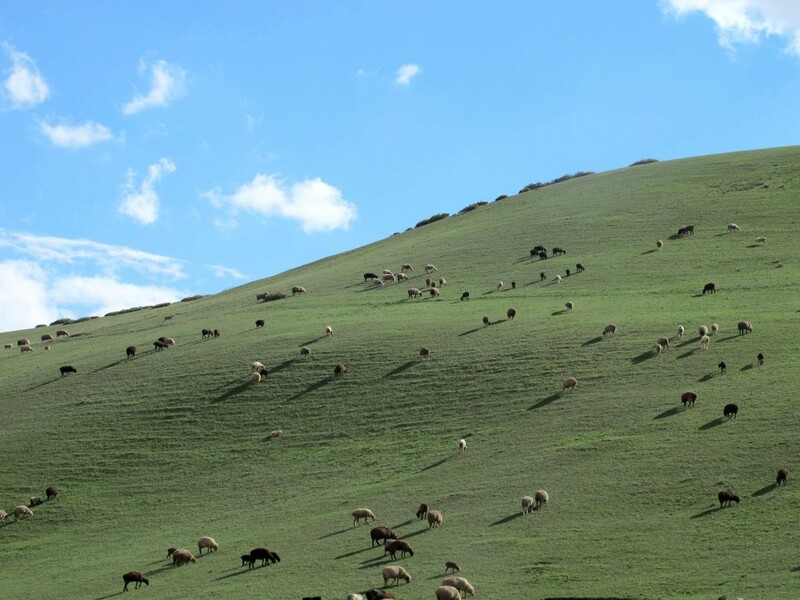 Tash Rabat sits in a narrow, beautifully-sloping valley. 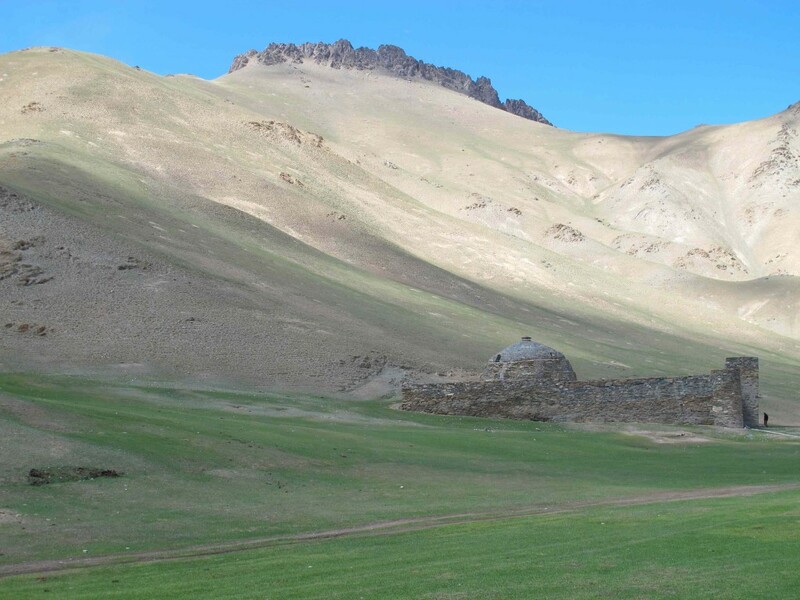 Therefore some Kyrgyz families have unsurprisingly chosen to make their home just meters from the the old, abandoned structure. Wait, that’s not a yurt. 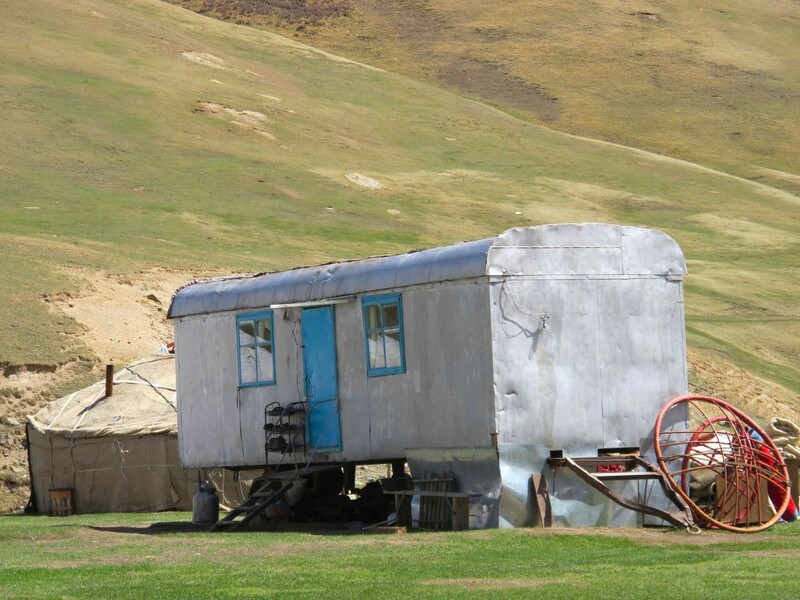 These shabby old trailers are scattered all over the mountains of Kyrgyzstan, and they’re used alternately as living spaces or kiosks for vending honey, dairy goods, and other products. Note the big red wheel–that’s not a wheel. It’s a tunduk, or the roof-ring for a yurt. With each passing night that I sleep in a yurt, I’ve become more familiar with this shape that spans the interior of the yurt’s roof. Lying on your back, you spend hours staring at it, so it’s no surprise that the tunduk has become an important symbol of Kyrgyz culture. I t’s depicted on Kyrgyzstan’s national flag and also in some modern architecture here. 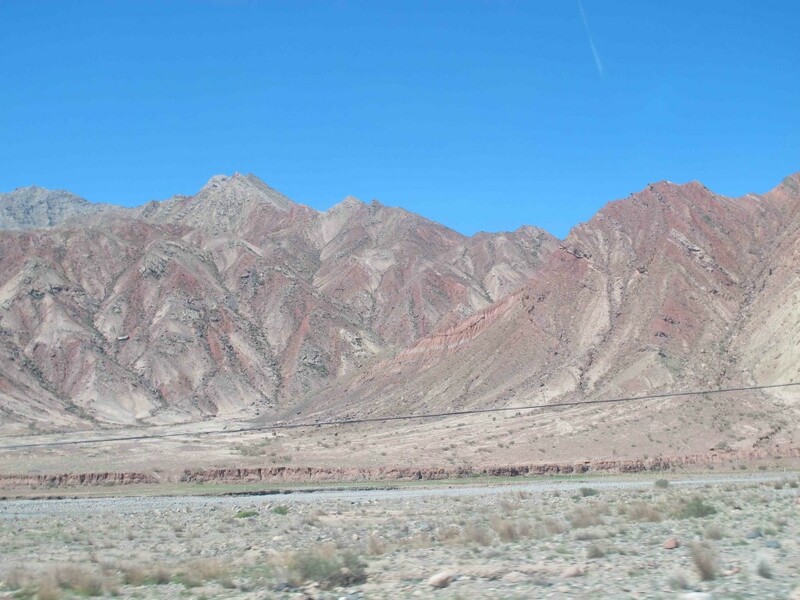 The road from Tash Rabat onward to the southern town of Naryn opens into a wide valley with great views of the Tian Shan Mountains. 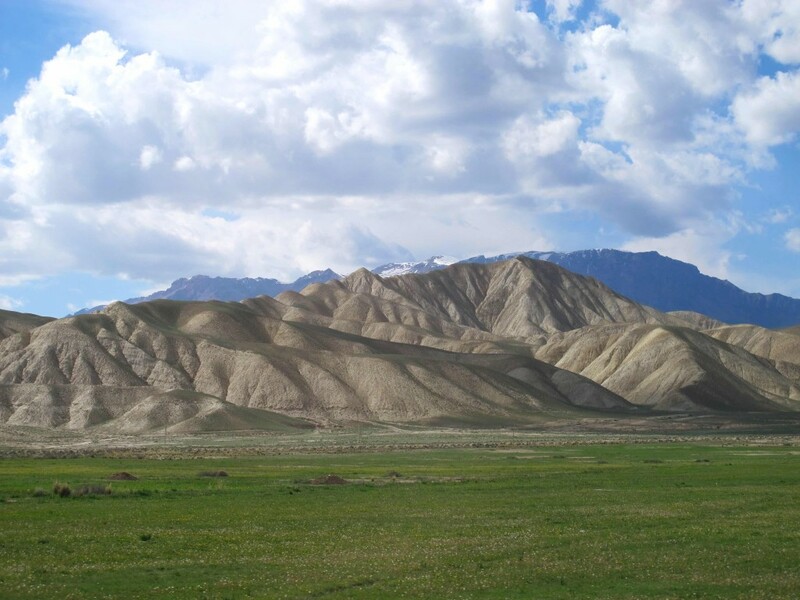 The lower-altitude landscapes in Kyrgyzstan are often sandy and cut by centuries of running water. These hills sometimes shine as though they’ve been draped in beige silk. In other areas, different soils and ground cover create hills that appear white, red, or black. 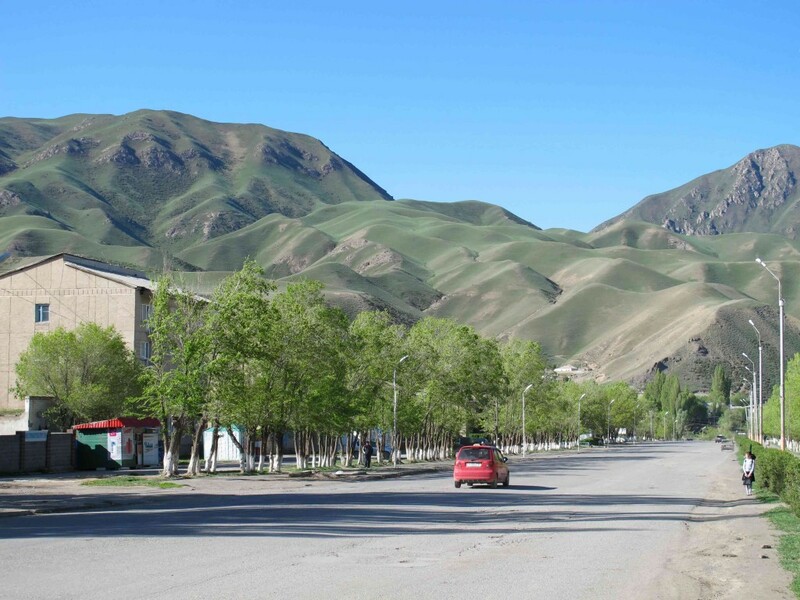 My border crossing ended in Naryn, a small provincial town in Southern Kyrgyzstan that was once an important silk road stopover. I spent a night here before heading onward to Bishkek.